Teaching can be so messy. And learning to teach even messier. Having in most cases only personal experience to draw from, many student-teachers struggle to consider how theory might translate into classroom practice. Sure, rich dialogue happens often in pre-service programs. And students are frequently called upon to be reflective as they journey through their education courses (heck, when I was working on my teaching certificate, we wrote reflections about reflections that we had while we were reflecting…yes, you get the point). And maybe, just maybe, new educators are given some powerful, experiential kinds of inquiry tasks…tasks that require them to create products that embody or perhaps critique some of the concepts they encounter while learning to teach. Most would agree that taken together, dialogue, reflection, and production are important acts for both teachers and learners to practice. However, these acts without an understanding of context can be vapid. Furthermore, it might be far too easy to overlook the ideological undercurrents of teaching decisions if one is not given the opportunity to interrogate what each of these acts mean to particular people, in distinct places, and for a variety of purposes. 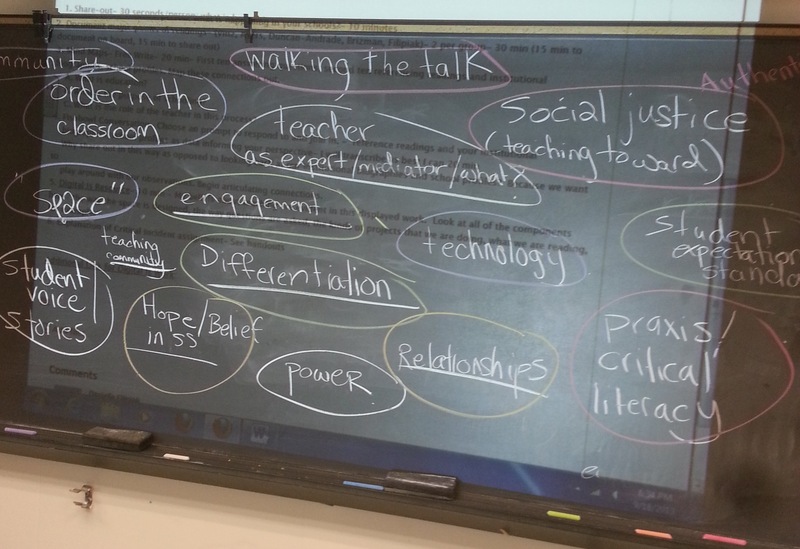 Consider themes and skills that pre-service classes focus on, for instance: effective planning, classroom management, fostering connections between texts and the “real world,” to name a few. Each of these mean something different given the young people that these teachers are in front of, given who they are, given what communities they reside within, given what problems and opportunities surround them, given what is happening at the local, national, and even global levels. While many pre-service teachers read about diverse perspectives and are exposed to interpretations of events that are happening outside of their everyday experience, it is not often that they have opportunities to engage in interactions with the people- the human beings, who possess these divergent perspectives and interpretations. Consequentially, it becomes far too easy to dialogue, reflect, and produce in ways that re-affirm their own viewpoints rather than challenge them. And therein lies the difficulty in preparing student teachers to enter into classrooms that reflect an increasingly pluralistic society. Most simply don’t have enough opportunities to engage in authentic human interactions with educators on the ground who possess diverse viewpoints about teaching and learning. Given this, for teacher-educators (teachers of teachers) who are tasked with disrupting viewpoints while also constructing a safe space for tensions to be held with care, crafting generative discussions that push pre-service teachers outside of their comfort zones can be challenging. As a new(er) teacher-educator myself, I quickly discovered that neither the readings I assigned nor the discussions we had were enough; I knew we needed more. Supporting student-teachers in navigating and constructing teacher identities, I soon realized, would take a village. It would require multiple voices and perspectives, and a variety of tools. Very much influenced by the Connected Learning framework as a Connected Learning Ambassador, I thought about how I might tinker with digital tools in our classroom to facilitate powerful, relevant, and engaging conversations about teaching and learning with folks outside of our classroom. I was also inspired by Cindy O’Donnell and Antero Garcia’s work with educators at Colorado State University; Cindy planted the seed for this initiative when she assigned her students to engage with a resource I created while teaching in Detroit, and later invited me in for a conversation via Google Hangout to speak to her class. Here is the reflective piece I put together after I participated in this exchange. In this resource, I share the small moves I made to bring multiple voices into our classroom around topics and themes that are common in pre-service classrooms. Using Google Hangout as a platform for dialogue, I helped mediate discussion panels between pre-service English teachers enrolled in a course I taught at Teachers College, Columbia University, and individuals around the country wearing hats as professors, teachers, graduate and undergraduate students, and teaching artists. This allowed for critical insight into teaching decisions and the varying contexts that significantly influenced them, as each person who I invited in worked with young people in a different capacity. Imagine watching, for instance, a young community organizer/artist/writer from Nigeria, a third-year college student from Detroit, and a post-doc at UCLA with several years of teaching experience under her belt discussing ways to build stronger school/community connections. Organic exchanges like this touched on the subtleties and nuances of teaching and learning. Far from neat and scripted, the dialogue that occurred surfaced tensions while also modeling powerful inter-generational dialogue, and did so in a way that in a manner that felt intimate, accessible, direct, and authentic. Like teaching, this initiative was messy and uncomfortable at times. There were instances of panel speakers pulling out at the last minute, our technology was sketchy during one of the conversations, and there were silences that felt amplified by the physical distance between the invited speakers and our classroom in New York. Nevertheless, the questions that students posed later on inside of papers and classroom discussions led me to believe that the challenges were worth it, and probably a necessary part of the process. In sharing pieces of the process in the following pages of this resource, I am aware that there is much to be improved upon, and that my exploration in many ways has just begun. With this in mind, while I hope that educators from varying backgrounds will find the videos, discussions and student reflections here helpful, I am also aspiring to connect with more educators who would like to join our conversations and engage with our educator community. If this sounds like something you’d be interested in, I can be reached at drf2127@tc.columbia.edu or @flipster33 via Twitter.